25 years ago Jim Beam Master Distiller Booker Noe helped change the bourbon landscape with the release of Knob Creek bourbon. Knob helped usher in a small batch movement that continues to this day. 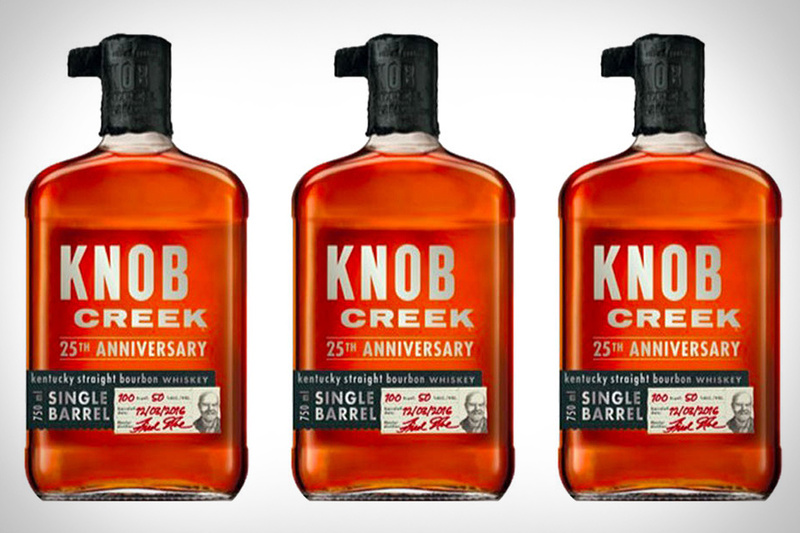 To celebrate the anniversary of this important release, the folks at Beam are releasing a limited edition, unfiltered, cask strength, single barrel version of Knob Creek. It was aged for 12-13 years, and the proof ranges between 120-125. Since it's a single barrel release, there are slight nuances and variations with each barrel. The bottles arrive in a sharp, wooden box that features a unique label, including a handwritten bottling date and proof. In 1792, Kentucky became a Commonwealth and the 15th state to join the nation. This year marks the 225th anniversary of that historic milestone, and Barton Distillery is ready with a special release. 1792 225th Anniversary Bourbon was aged for ten years at the distillery before being bottled at exactly 92.15 proof. The proof is so precise because it too pays homage to the year and Kentucky being the 15th state in the Union. The dark blue neck band on the bottle and back label are also nods to the official state seal of Kentucky. And by the way, you can only purchase this limited edition release in the Bluegrass state, making it an even more desirable treasure for collectors. Released to celebrate Al Young's 50th year with Four Roses, this blend includes four of their proprietary 10 recipes - the oldest of which is a 23-year-old bourbon made during Young's time as Distillery Manager. The bottle design is a tribute as well, inspired by a label from 1967, the year Young started his career. Named after William LaRue Weller, a bourbon pioneer who substituted wheat into his bourbon recipes in place of Rye, Weller 12 is consistently mentioned among some of the best bourbons being made today. And just like its namesake, the entire Weller line has reached legendary status in recent years due to its affordability and the fact that it shares a home distillery and mashbill with another wheater known as Pappy Van Winkle. Aged for 12 years and boasting a brand new bottle design, it's one of the best deals in the bourbon world — if you can find it. There was a time when you couldn't trust decent bourbon unless it was distilled in Kentucky. But thanks to releases like Cedar Ridge Iowa Bourbon, that is quickly changing. Crafted in the heart of corn country and distilled to a higher proof before being bottled at 80 proof, Cedar Ridge is a balanced, flavorful bourbon. A unique herbal quality highlights this whiskey and has helped it take home several gold medals in competitions over the past few years. The second and latest release in the Wild Turkey Master's Keep collection is ready to consume, and it's another bourbon a great story that is blended masterfully. Wild Turkey Master's Keep Decades Bourbon celebrates Master Distiller Eddie Russell on his 35th anniversary at Wild Turkey. The son of bourbon baron Jimmy Russell, who he still distills with side by side, had to learn the bourbon business from the ground up starting in 1981 when he clocked in for his first day of work. Now, Eddie finally gets a share of the well-deserved spotlight with Decades, a blend of whiskies aged 10 to 20 years and bottled at 104 proof. It's tough enough to get your hands on Van Winkle bourbons, and the latest, and oldest release from the Pappy distillers promises to be even more exclusive. Old Rip Van Winkle 25-Year-Old Bourbon was distilled in the spring and fall of 1989 and stored on lower levels of a metal warehouse built in 1935 at the Van Winkle family distillery. In 2002 the barrels found a new home at Buffalo Trace and in 2014 the juice was dumped into stainless steel tanks to halt the aging process. And now, it's ready for release. But only 11 barrels made the full trip, resulting in a mere 710 bottles. Each one is housed in a handmade glass decanter with bottle information, individual numbering, and a hand finished silver stopper. The special bottles reside in a handmade wooden box that comes with a bourbon certificate of authenticity, numbered and signed by Julian Van Winkle himself.